In a separate frying pan, warm up 1 tbsp of olive oil. 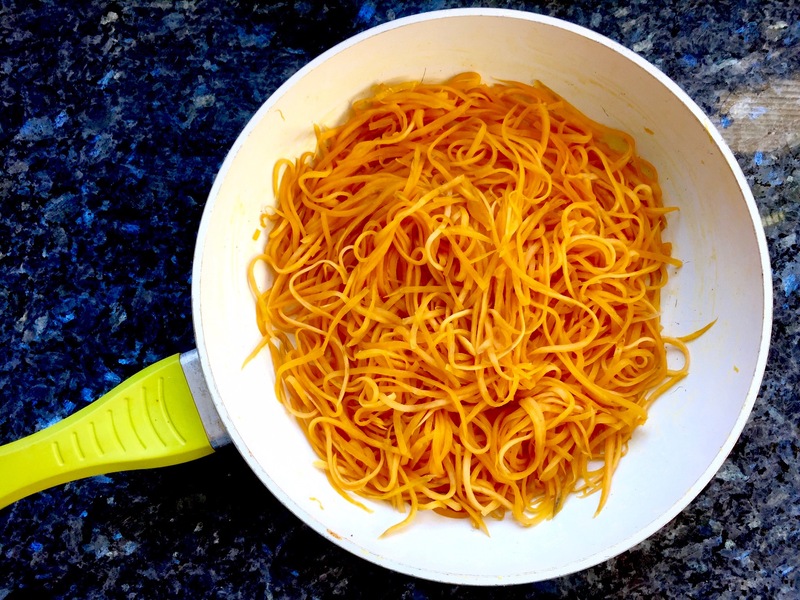 Add sweet potato noodles and cook on medium-low heat for 4-5 minutes, stirring once or twice each minute. You want the noodles to keep somewhat of a crunchy texture to them so they don’t wilt under the sauce. I’ve never been a fan of boiling noodles. They take ages, and I end up obsessively watching the pasta cook for the last 5 minutes, constantly testing it to make sure it’s done. 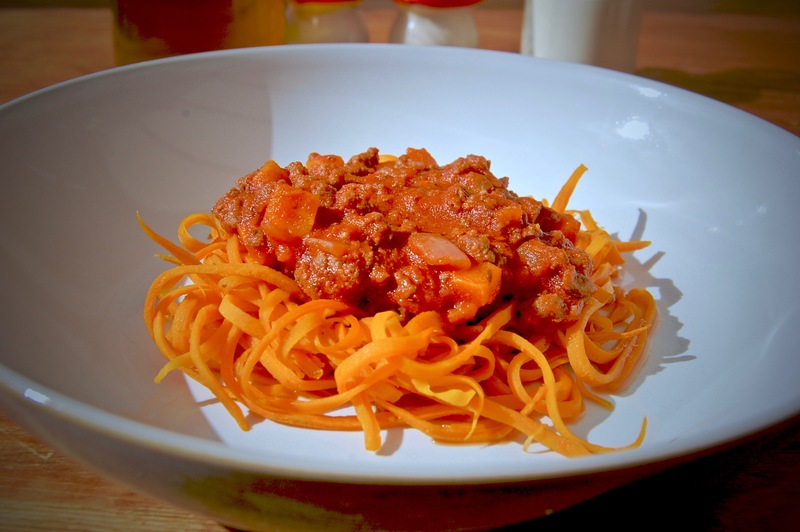 Sweet potato noodles solves that problem! Not only do these ‘noodles’ increase the nutritional value of the meal, but they take about 4 minutes to cook. Super simple! As a mother and a nutritionist, I choose to restrict many grains and refined flours. 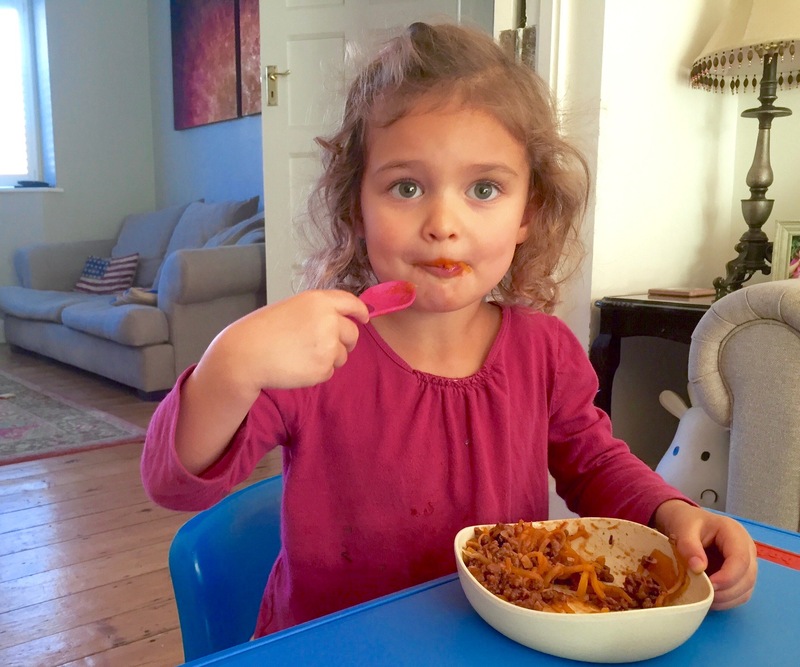 I do this as a lifestyle choice for myself and also as a guideline for weaning and toddler nutrition, especially 0-2 years. Don’t get me wrong, I love a sandwich, and one of my best food experiences from my holiday in Italy was the large bowl of four cheese pasta that got devoured with a bottle of wine. I consider grains such as pasta and bread a treat, like ice cream, rather than a staple. Both are a carbohydrate, and carbohydrates along with protein and fat are categorized as macronutrients. A balanced macronutrient intake is essential for optimal health. As a starchy carbohydrate replacement, I prefer root vegetables like sweet potatoes and squash. I always have sweet potatoes in the house. Sweet potatoes are a nutrient powerhouse, packed with vitamins A and C, two well known antioxidants and immune supporters, as well B vitamins which our bodies require daily to make energy. Sweet potatos are also very easily digested – perfect for the developing digestive tract of a baby or toddler, and contain good fibers that when digested help to improve the microflora in the gut, contributing to a healthy digestive tract. Sweet potatoes are in season almost the entire year, making them a versatile and accessible carbohydrate.